Fatigue, overreaching, and having the wrong ladder for the job cause the vast majority of ladder accidents. We designed the Select Step® Fiberglass A Frame Ladder to address these factors. The Select Step Fiberglass A Frame Ladder is fully adjustable on both sides, so you can use it in multiple heights and configurations. No matter how you set it up, the patent-pending Select Step provides a comfortable standing platform that offers heel-to-toe foot support at the top recommended step. We also removed the unusable top rung to prevent operators from unsafely climbing above to the top recommended step. Because both sides telescope independently, you can use the Select Step safely over obstacles, sloping ground, and on stairs or uneven surfaces. 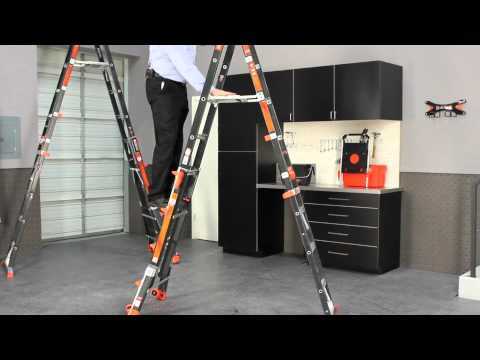 Select Step is the only fiberglass stepladder that allows you to safely work on stairs. The Select Step features the fast, easy-to-use Rock Lock® rung fasteners and SelectGrip™ Handle for telescoping the ladder up and down to help you work faster with less fatigue from handling a tall stepladder. I am very pleased with the ladder. I weigh over 300 lbs and feel safe on it. A-Frame Max. Height 8 ft. 10 ft. Storage Height 5 ft. 1 in. 6 ft. 1 in. Storage Width at Base 2 ft. 5 in. 3 ft. Ladder Weight 34 lbs. 41 lbs. Shipping Weight 40 lbs. 53 lbs.